ABSTRACT:- One-Fifth population of the earth is lacking safe drinking water.Civil Final Year Projects There is a scarcity of the clean water. About 75% of farming lands are entirely lacking of proper irrigation water. When the waste water from the Industries flows out, it pollutes the water in the rivers and lakes thus affecting the purity of water which makes an impact on the aquatic life as well as the crops which are irrigated by the water from the rivers or lakes. Contaminated water plays significant role in affecting numerous lives. Again in some areas during summer we face water problems as lots of water after day to day domestic use are simply unutilized. 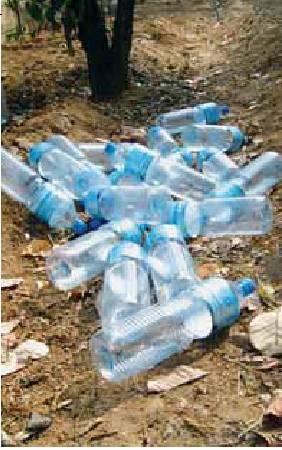 This waste water from domestic use and industries constitute a major part of processed water that is not only being unutilized but also causing water pollution. In this work we have tried to develop and design the waste water purifying technique and whole plant setup for the purification of both industrial and domestic used waste water. The whole plant setup is being designed in order to purify the waste water containing a significant level organic and inorganic compounds both in dissolved and un-dissolved form. 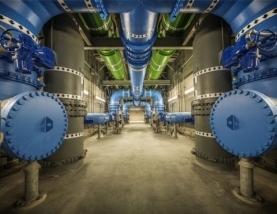 This water treatment process basically utilizes the ASP (Activated Sludge Process) and AOP (Advanced Oxidation Process) which are not only highly efficient in organic and inorganic compounds removal but also provide a high level of disinfection. In ASP microorganisms were refined in ASP tank and removal of organic compounds takes place. In AOP tank UV light is used with H2O2 in order to remove odor, inorganic components and to achieve a high level of disinfection. Along with the above two processes, the general water treatment processes like preface and primary water treatment were also done in order to remove inorganic and colloidal particles. The treated water from the designed plant set up was found to be almost free of any organic & inorganic contaminants and was found to be ideal for use in irrigation process, day to day domestic use, as process water in the industries itself and can also be used for drinking intention. For the process of primary treatment we have had a tank of the shape of a cylinder, in order to the sedimentation of large particles in the water. A screen has been provided with a bar so as to remove large particles from entering to the treatment process. Here we were intended to settle colloidal particles, iron particles, other inorganic compounds as well as some heavy particles by subjecting the water to aeration in a conical bottom tank and the settled impurities in the form of sludge would be taken out from the bottom. In order to settle some undissolved ions, inorganic and organic particles, in a conical settling tank it would be fed by alum and settling allowed taking place. 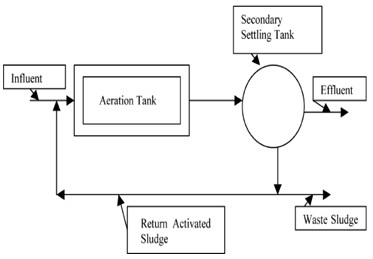 Secondary treatment process is basically done by activated sludge process and consists of two tanks. One is for aeration tank where microorganisms are grown and second one is a clarifier where the settling of impurities takes place. A recycle stream known as recycle activated sludge (RAS) is there in order to maintain microorganism count in significant level. In clarifier air compressor has been used for enhancing settling of particles. • In our developed process, the tertiary treatment process is AOP utilizing UV light in presence of H2O2 in a cylindrical tank. • It not only provides settling of organic and inorganic compounds but also provides highest degree of disinfection. • For the convenience for the whole design process we had used 20 liter water tanks. So from our modeling approach we had prepared a flow sheet of the entire water treatment process shown in the next page. Raw water is first stored in a cylindrical storage tank in order to settle heavier particles like sand and clay. A separation screen has been provided at the outlet of the storage tank in order to prevent large particles to pass through. After pre-treatment stage the water is entered in primary treatment where at first it is subjected to aeration and due to which heavier particles upon aeration subjected to settle for example heavier metal particles, some inorganic compounds and heavier iron particles. Then the water is subjected to sedimentation process in a sedimentation tank where it is fed with alum in order to settle down a no. of impurities both organic and inorganic particles as well as ions. This completes the primary water treatment process. After that the water is subjected to secondary treatment process which basically activated sludge process. Microorganisms are culture and proper nutrition is provided for their growth. The microorganisms basically break-up the organic compounds in carbon dioxide. They also reduce the nitrates and phosphates for their growth. Along with these matters they also utilize the trace elements like potassium, magnesium and iron while calcium, sodium and silica may be necessary for the growth of the microorganism. There may also be a requirement for traces of zinc, copper, cobalt, manganese and molybdenum for their growth. 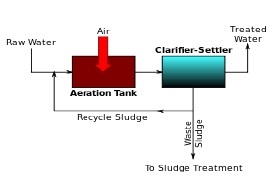 The settled impurities are removed in the form of activated sludge in the clarifier tank. In the secondary treatment process no. of impurities are separated from the water. At the exit of the clarifier there is a ultra-filter provided in order to prevent flow of cultured microorganisms out of the clarifier. There is also a recycling stream from the clarifier to the aeration tank in order to achieve maximum removal of the undesired components. This completes the secondary treatment. The water enters the tertiary treatment stage in the advanced oxidation tank. 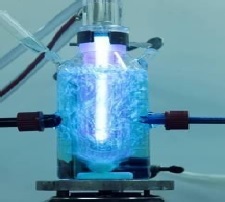 Here the water is subjected to UV light and H2O2 is added in order to release hydroxyl radicals. In this process if present organic compounds are completed eliminated along with that any inorganic compound present also reduces and settles down. The UV light breaks the nucleic acid part of the microorganism there by providing about 99.9% disinfection. This AOP is helpful in further reduction of overall COD as well as color and odor removal. This completes the tertiary treatment process. The treated water is stored in a storage tank and can be utilized as irrigation water, process water for industries, domestic use and as drinking water. Shorted Angle for frame designing. Test tubes, beakers & flasks. First of all the frame design has been considered. For that purpose shorted angle was taken to carry out framing for plant design. The dimension of the frame has been set as following. The frame has been designed so as to have a perfect design to contain all the process tanks & equipments wherever necessary. The plant layout has been done with the help of various tools. The fabrication of process tanks, piping, sealing the tanks & piping using silicon paste has been done. Fabrication of tanks has been done in such a way that under any circumstances there will not be any leakage. Water and air pump has been installed and joined with proper piping and wiring. Most careful work was the design of the Oxidation Tank holding UV Lamp in a circular vessel inside the cylindrical tank with proper insulation to avoid any water to leak through it and result in dysfunction of UV Light. Raw water storage tank equipped with screen. CONCLUSION:- After this work, we can conclude by saying that, although the installment cost of the setup for the plant is very high but it is found in this study that the maintenance cost is very low and is economical and therefore it can be put to use. It was seen that there is a significant reduction in the hardness and the water turbidity is showing that it has a high purification efficiency. Also about 98% disinfection has been achieved after post treatment. There seen to be high reduction in metal ion and total dissolved solid content. Removal of alkanity of water also a major advantage i.e. pH dropped to 7.2 from 9.8 level. So from the above fact the whole treatment is seem to be economical and highly efficient for water treatment containing high organic as well as inorganic components and also gives nearly complete disinfection which may be used for drinking water. The water can be used for the irrigation purpose before the advancement to the oxidation stage. For textile industries the effluent water can be treated with the concerned process to have contaminants level below the environmental pollution level. 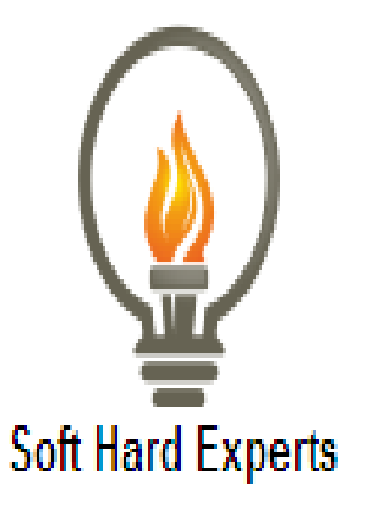 The one of the useful part is in the solid sludge which gets settled bot in culture and ASP settling tank which is rich in organic contents and that can be used as a solid fuel for many things. Overall conclusion is that the process is found out to be like, take and then put it in use.